Joey Eddis (white) hand fights with an Olathe North wrestler at the Sunflower League Meet on Feb. 9, 2019, at FSHS. 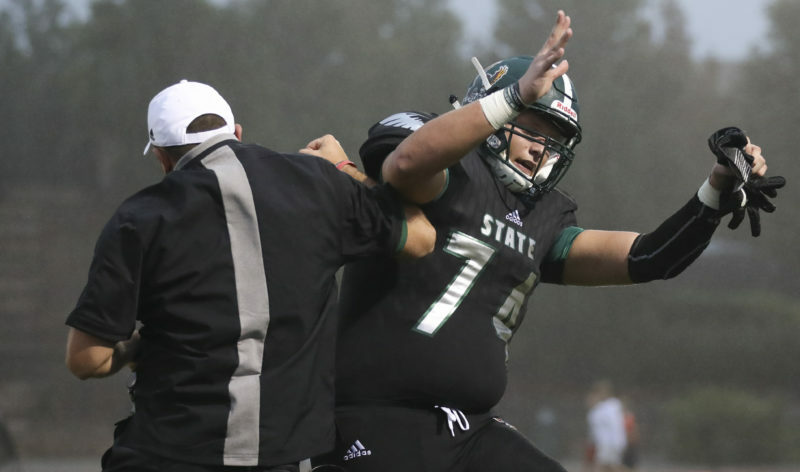 It was hard for Free State senior Devin Beers to contain his excitement, and it was even harder for his teammates and coaches to contain theirs. Beers pinned Olathe East’s Wyatt Mackley 18 seconds into the second round for the Firebirds’ third and final individual league title on the day. The Firebirds placed second at the Sunflower League meet Saturday afternoon at FSHS with 207 team points and 11 wrestlers making the podium. Lawrence High placed seventh as a team with 101 points, a pair of titles and six individual placers. Five Firebirds made their way to the championship matches in their respective weight classes: Ben Mellenbruch, Lou Fincher, Elijah Jacobs, Joey Eddis and Beers. Joey Schmidtberger just missed the championship round with a late loss to an Olathe South wrestler, but battled his way back in the consolation round to place third with a first-period pin. Eddis would go on to win his bracket at 170 pounds with an 8-6 sudden victory over Olathe North’s McCoy Stoker. After being taken down in the final seconds of the match to tie the match at 6 points, Eddis scored the final 2 points just 34 seconds into overtime. Eddis had once lost to Stoker at state. 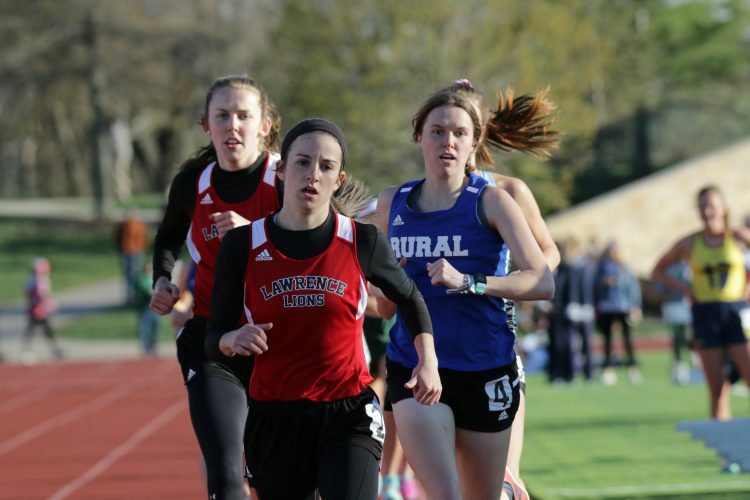 Though the City Showdown may have been canceled twice, the two schools still found ways to meet at league. Free State senior Chance Branson knocked Lawrence senior Justin MIller out of the bracket in the third consolation round with a 16-4 major decision. Lawrence junior Gentry Dennison won by an 8-3 major decision over Free State sophomore Austin Burenheide. Freshmen Kevin Honas of LHS and Ben Mellenbruch of FSHS kicked off the championship round at 106, with Honas taking the first title of the day for the Lions. The second Lion in the finals earned the team its second win, as well. Senior EJ Jewsome pinned Gardner Edgerton’s Shawn Waters in the first period to go 4-0 on the day. Denison netted a first-period pin in the third-place match for the Lions. AJ Powell won an ultimate tie-breaker in the consolation semifinals to reach the third-place match, but was pinned by a Gardner Edgerton wrestler in the second period. Zach Razak placed sixth, reaching the fifth-place match with technical fall win over Shawnee Mission West’s Ricky Hargis. 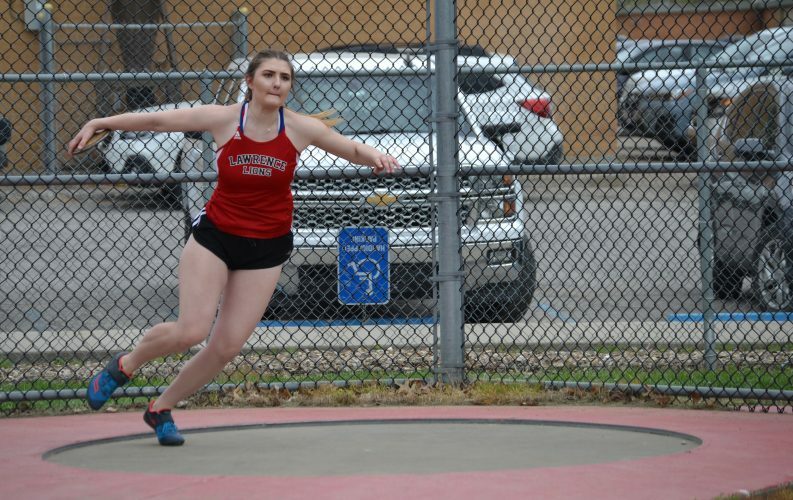 Both teams are set to compete in KSHSAA regionals on Saturday at Garden City High School. Six of the teams from the Sunflower League are among the 10 at regionals. Team scores: 1. 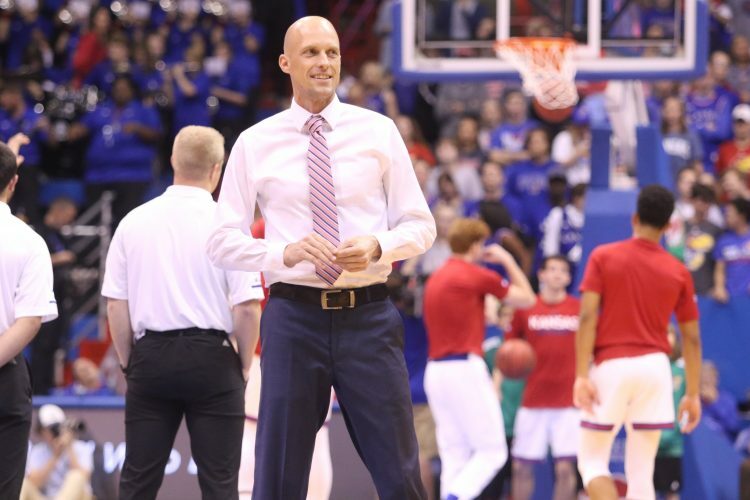 Olathe North 239; 2. Lawrence Free State 207; 3. Olathe South 174; 4. Olathe Northwest 147; 5. Gardner Edgerton 145; 6. Olathe East 121; 7. Lawrence 101; 8. SM Northwest 71; 9. SM West 65; 10. SM East 45; 11. Olathe West 41; 12. SM North 32.5; 13. SM South 8. 106: Kevin Honas (LHS, 27-8) placed 1st and scored 26.0 team points; Ben Mellenbruch (FS, 12-14) placed second and scored 16.0 team points. Quarterfinal – Kevin Honas (Lawrence) 27-8 won by fall over Charle Kallemeier (SM East) 6-12 (Fall 1:29). Semifinal – Kevin Honas (Lawrence) 27-8 won by fall over Dean Marshall (Gardner Edgerton) 4-12 (Fall 0:19). Ben Mellenbruch (Lawrence Free State) 12-14 won by decision over Nick Savage (Olathe Northwest) 14-19 (Dec 4-0). 1st Place Match – Kevin Honas (Lawrence) 27-8 won by fall over Ben Mellenbruch (Lawrence Free State) 12-14 (Fall 0:24). 113: Logan Farrell (LHS, 22-7) placed 1st and scored 11.5 team points; Trey Shanks (FS, 15-12) place is unknown. Quarterfinal – Collin Smith (Gardner Edgerton) 23-16 won by fall over Trey Shanks (Lawrence Free State ) 15-12 (Fall 4:52). Logan Farrell (Lawrence) 22-7 won by tech fall over Jacob Bragg (Olathe East) 13-23 (TF-1.5 5:20 (15-0)). Semifinal – Collin Smith (Gardner Edgerton) 23-16 won by fall over Logan Farrell (Lawrence) 22-7 (Fall 6:29). Cons. Round 1 – Jacob Bragg (Olathe East) 13-23 won by decision over Trey Shanks (Lawrence Free State ) 15-12 (Dec 7-5). Cons. Semi – Logan Farrell (Lawrence) 22-7 won by decision over Tyler Johnson (Olathe South) 25-17 (Dec 3-2). 120: Ezra Birdashaw (FS, 1-4) place is unknown and scored no team points. Quarterfinal – Gabriel Arreguin (SM North) 19-19 won by decision over Ezra Birdashaw (Lawrence Free State ) 1-4 (Dec 4-3). Cons. Round 2 – Mateo Palma (Olathe South) 11-11 won by fall over Ezra Birdashaw (Lawrence Free State ) 1-4 (Fall 4:09). 126: Lou Fincher (FS, 27-5) placed 2nd and scored 21.0 team points; Zach Razak (LHS, 3-19) placed 6th and scored 8.5 team points. Quarterfinal – Keegan Slyter (Olathe North) 38-4 won by fall over Zach Razak (Lawrence) 3-19 (Fall 0:45). Lou Fincher (Lawrence Free State ) 27-5 won by fall over Xavier Reyes (SM Northwest) 5-11 (Fall 0:25). Semifinal – Lou Fincher (Lawrence Free State ) 27-5 won by major decision over Ben Bluel (Olathe South) 23-16 (MD 8-0). Cons. Round 2 – Zach Razak (Lawrence) 3-19 won by fall over Joseph Dalton (SM East) 1-6 (Fall 0:46). Cons. Round 3 – Zach Razak (Lawrence) 3-19 won by tech fall over Ricky Hargis (SM West) 5-3 (TF-1.5 2:56 (18-1)). Cons. Semi – Ben Bluel (Olathe South) 23-16 won by fall over Zach Razak (Lawrence) 3-19 (Fall 0:57). 5th Place Match – Evan Shelkey (Olathe West) 8-9 won by fall over Zach Razak (Lawrence) 3-19 (Fall 1:29). 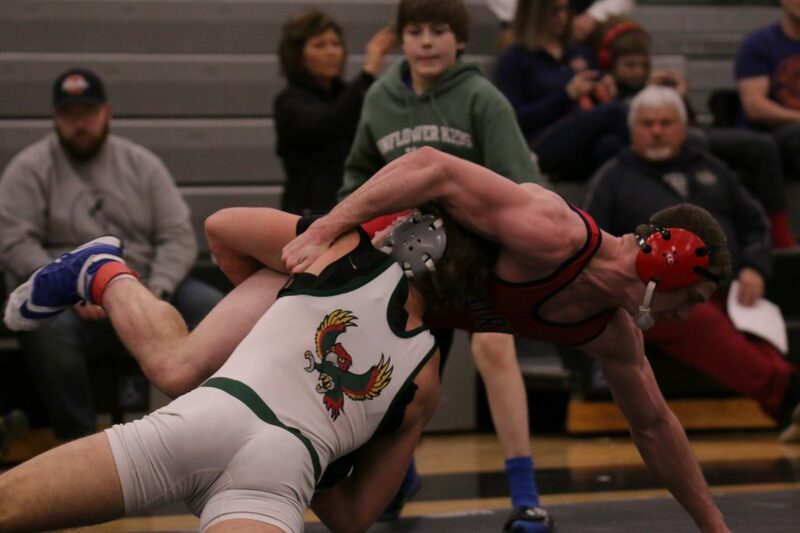 1st Place Match – Keegan Slyter (Olathe North) 38-4 won by decision over Lou Fincher (Lawrence Free State ) 27-5 (Dec 12-5). 132: Caleb Streeter (FS, 22-10) placed 3rd and scored 20.0 team points; Dominic Chieu (LHS, 0-2) place is unknown and scored no team points. Quarterfinal – Gunner Murphy (Olathe North) 38-14 won by fall over Dominic Chieu (Lawrence) 0-2 (Fall 1:32). Caleb Streeter (Lawrence Free State ) 22-10 won by fall over Daniel Boose (SM West) 15-11 (Fall 3:29). Semifinal – Dallas Koelzer (Olathe South) 33-5 won by major decision over Caleb Streeter (Lawrence Free State ) 22-10 (MD 12-2). Cons. Round 3 – Vlad Honc (Olathe Northwest) 18-17 won by fall over Dominic Chieu (Lawrence) 0-2 (Fall 1:51). Cons. Semi – Caleb Streeter (Lawrence Free State ) 22-10 won by fall over Vlad Honc (Olathe Northwest) 18-17 (Fall 2:06). 3rd Place Match – Caleb Streeter (Lawrence Free State ) 22-10 won by fall over Brayden Ratcliffe (Gardner Edgerton) 29-16 (Fall 4:29). 138: Andrew Park (FS, 10-10) placed 6th and scored 9.0 team points; Ethan Tosee (LHS, 0-4) place is unknown and scored no team points. Champ. Round 1 – Andrew Park (Lawrence Free State ) 10-10 won by fall over Ethan Tosee (Lawrence) 0-4 (Fall 3:47). Quarterfinal – Andrew Park (Lawrence Free State ) 10-10 won by decision over Kadyn Humphrey (Gardner Edgerton) 8-7 (Dec 8-7). Semifinal – Curte`z Riley (SM Northwest) 20-2 won by fall over Andrew Park (Lawrence Free State ) 10-10 (Fall 0:32). Cons. Round 2 – Bobby Thomas (Olathe South) 22-17 won by fall over Ethan Tosee (Lawrence) 0-4 (Fall 0:39). Cons. Semi – Bobby Thomas (Olathe South) 22-17 won by major decision over Andrew Park (Lawrence Free State ) 10-10 (MD 14-0). 5th Place Match – Justus Hulse (SM North) 22-19 won by fall over Andrew Park (Lawrence Free State ) 10-10 (Fall 3:37). 145: Elijah Jacobs (FS, 19-4) placed 1st and scored 27.0 team points; Henry DeWitt (LHS, 2-18) place is unknown and scored no team points. Champ. Round 1 – Caleb Rosebaugh (SM Northwest) 7-25 won by major decision over Henry DeWitt (Lawrence) 2-18 (MD 9-1). Quarterfinal – Elijah Jacobs (Lawrence Free State ) 19-4 won by fall over Caleb Rosebaugh (SM Northwest) 7-25 (Fall 1:07). Semifinal – Elijah Jacobs (Lawrence Free State ) 19-4 won by fall over Hugo Romero (SM East) 20-15 (Fall 3:35). Cons. Round 2 – Zach Stegeman (Olathe Northwest) 18-21 won by fall over Henry DeWitt (Lawrence) 2-18 (Fall 0:47). 1st Place Match – Elijah Jacobs (Lawrence Free State ) 19-4 won by major decision over Jose Cervantes (Olathe North) 35-15 (MD 9-1). 152: Jordan Kryfka (FS, 13-8) placed 4th and scored 14.0 team points; Fransoir Jones (LHS, 6-16) place is unknown and scored 3.0 team points. Quarterfinal – John Redmond (Olathe Northwest) 26-14 won by fall over Fransoir Jones (Lawrence) 6-16 (Fall 5:03). Jordan Kryfka (Lawrence Free State ) 15-10 won by decision over Mitchell Cardello (Olathe East) 23-16 (Dec 9-2). Semifinal – John Redmond (Olathe Northwest) 26-14 won by tech fall over Jordan Kryfka (Lawrence Free State ) 15-10 (TF-1.5 4:17 (15-0)). Cons. Round 2 – Fransoir Jones (Lawrence) 6-16 won by fall over Tyler Fehrenbacher (Olathe West) 5-17 (Fall 2:20). Cons. Round 3 – Mitchell Cardello (Olathe East) 23-16 won by fall over Fransoir Jones (Lawrence) 6-16 (Fall 2:53). Cons. Semi – Jordan Kryfka (Lawrence Free State ) 15-10 won by fall over Gerald Young (SM East) 12-13 (Fall 1:30). 3rd Place Match – Landon Wilkes (Olathe North) 29-14 won by fall over Jordan Kryfka (Lawrence Free State ) 15-10 (Fall 4:16). 160: Justin Miller (LHS, 14-19) place is unknown and scored 1.0 team points; Chance Branson (FS, 9-5) placed 4th and scored 16.0 team points. Champ. Round 1 – Chance Branson (Lawrence Free State ) 9-5 won by fall over Jake Herl (Olathe Northwest) 5-16 (Fall 3:15). Quarterfinal – Jaxon Avena (Olathe East) 23-15 won by fall over Chance Branson (Lawrence Free State ) 9-5 (Fall 4:28). Gavin Brown (Olathe South) 32-5 won by fall over Justin Miller (Lawrence) 14-19 (Fall 2:35). Cons. Round 2 – Chance Branson (Lawrence Free State ) 9-5 won by decision over Gage Witzke (Olathe West) 3-3 (Dec 7-0). Justin Miller (Lawrence) 14-19 won by decision over Martin Levendusky (SM South) 9-19 (Dec 8-2). Cons. Round 3 – Chance Branson (Lawrence Free State ) 9-5 won by decision over Justin Miller (Lawrence) 14-19 (Dec 7-3). Cons. Semi – Chance Branson (Lawrence Free State ) 9-5 won by fall over Nick Wickham (SM North) 6-15 (Fall 2:22). 3rd Place Match – William Calixto (Olathe North) 24-27 won by decision over Chance Branson (Lawrence Free State ) 9-5 (Dec 2-0). 170: Joey Eddis (FS, 28-3) placed 1st and scored 26.0 team points; Thomas Ortiz (LHS, 2-9) place is unknown and scored no team points. Quarterfinal – McCoy Stoker (Olathe North) 24-7 won by fall over Tomas Ortiz (Lawrence) 2-9 (Fall 1:12). Joey Eddis (Lawrence Free State ) 28-3 won by fall over Alex Baiza (Olathe Northwest) 21-20 (Fall 4:23). Semifinal – Joey Eddis (Lawrence Free State ) 28-3 won by fall over Jacob Porrit (SM West) 25-7 (Fall 1:07). Cons. Round 3 – Josh Musick (Olathe East) 19-16 won by major decision over Tomas Ortiz (Lawrence) 2-9 (MD 15-5). 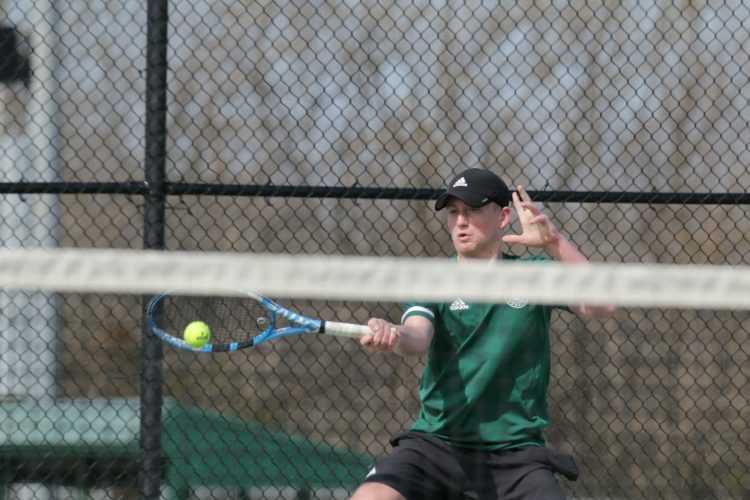 1st Place Match – Joey Eddis (Lawrence Free State ) 28-3 won in sudden victory – 1 over McCoy Stoker (Olathe North) 24-7 (SV-1 8-6). 182: Devin Beers (28-5) placed 1st and scored 26.0 team points; AJ Powell (LHS) placed 4th and scored 10.0 team points. Quarterfinal – Caden Rodriguez (Gardner Edgerton) 26-14 won by fall over AJ. Powell (Lawrence) 21-14 (Fall 3:01). Quarterfinal – Devin Beers (Lawrence Free State ) 28-5 won by fall over Will Steinbock (SM East) 6-13 (Fall 1:12). Semifinal – Devin Beers (Lawrence Free State ) 28-5 won by decision over Caden Rodriguez (Gardner Edgerton) 26-14 (Dec 6-2). Cons. Round 2 – AJ. Powell (Lawrence) 21-14 won by decision over Carter Lahmeyer (Olathe North) 21-26 (Dec 13-8). Cons. Round 3 – AJ. Powell (Lawrence) 21-14 won by decision over Will Steinbock (SM East) 6-13 (Dec 6-0). Cons. Semi – AJ. Powell (Lawrence) 21-14 won in the ultimate tie breaker over Max Knard (Olathe South) 28-13 (UTB 5-2). 3rd Place Match – Caden Rodriguez (Gardner Edgerton) 26-14 won by fall over AJ. Powell (Lawrence) 21-14 (Fall 3:48). 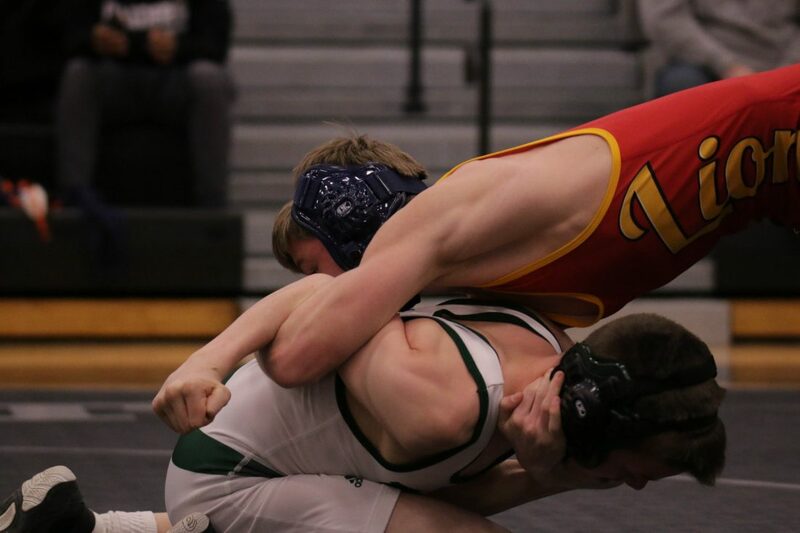 1st Place Match – Devin Beers (Lawrence Free State ) 28-5 won by fall over Wyatt Mackley (Olathe East) 26-8 (Fall 3:18). 195: Austin Burenheide (12-13) placed 6th and scored 7.0 team points; Gentry Dennison (LHS, 8-6) placed 3rd and scored 15.0 team points. Quarterfinal – Jarek Braden (Olathe South) 16-20 won by decision over Gentry Dennison (Lawrence) 8-6 (Dec 7-2). Quarterfinal – Austin Burenheide (Lawrence Free State ) 12-13 won by fall over Luke Zegunis (Olathe West) 8-16 (Fall 1:37). Semifinal – Jayden Avena (Olathe East) 30-10 won by major decision over Austin Burenheide (Lawrence Free State ) 12-13 (MD 19-5). Cons. Round 1 – Gentry Dennison (Lawrence) 8-6 won by major decision over Bret Summers (SM Northwest) 6-9 (MD 17-7). Cons. Semi – Gentry Dennison (Lawrence) 8-6 won by major decision over Austin Burenheide (Lawrence Free State ) 12-13 (MD 16-4). 5th Place Match – Jarek Braden (Olathe South) 16-20 won by decision over Austin Burenheide (Lawrence Free State ) 12-13 (Dec 5-2). 3rd Place Match – Gentry Dennison (Lawrence) 8-6 won by fall over Noah Short (Gardner Edgerton) 11-13 (Fall 1:33). 220: Joey Schmidtberger (14-6) placed 3rd and scored 22.0 team points; Ethan Rorabaugh (LHS) place is unknown and scored no team points. Champ. 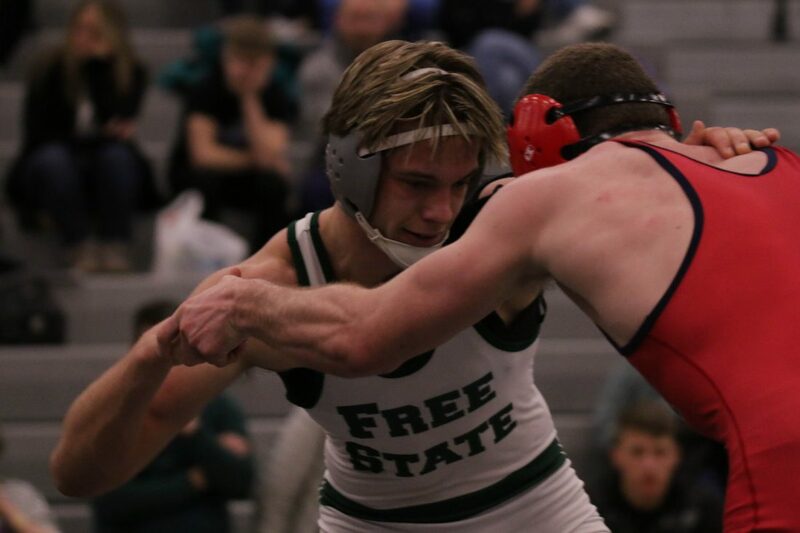 Round 1 – Joey Schmidtberger (Lawrence Free State ) 14-6 won by fall over Logan Hill (SM West) 9-13 (Fall 0:00). Saul Gomez (Olathe East) 16-13 won by decision over Ethan Rorabaugh (Lawrence) 0-12 (Dec 7-1). Quarterfinal – Joey Schmidtberger (Lawrence Free State ) 14-6 won by fall over Cade Conover (Olathe Northwest) 14-20 (Fall 1:35). Semifinal – Alec Younggren (Olathe South) 26-11 won by decision over Joey Schmidtberger (Lawrence Free State ) 14-6 (Dec 16-9). Cons. Round 2 – Cade Conover (Olathe Northwest) 14-20 won by fall over Ethan Rorabaugh (Lawrence) 0-12 (Fall 1:52). Cons. Semi – Joey Schmidtberger (Lawrence Free State ) 14-6 won by fall over Logan Hill (SM West) 9-13 (Fall 0:28). 3rd Place Match – Joey Schmidtberger (Lawrence Free State ) 14-6 won by fall over Cade Conover (Olathe Northwest) 14-20 (Fall 1:26). 285: EJ Jewsome (LHS, 21-8) placed 1st and scored 26.0 team points; Xavier Farley (FS, 4-9) place is unknown and scored 4.0 team points. Champ. Round 1 – Xavier Farley (Lawrence Free State ) 4-9 won by fall over Sam Verhulst (Olathe West) 9-20 (Fall 1:59). Quarterfinal – Ejae Jewsome (Lawrence) 21-8 won by fall over Xavier Farley (Lawrence Free State ) 4-9 (Fall 1:32). Semifinal – Ejae Jewsome (Lawrence) 21-8 won by decision over Brandon Pena (Olathe North) 12-8 (Dec 5-2). Cons. Round 3 – Eliab Tafera (Olathe Northwest) 1-3 won by fall over Xavier Farley (Lawrence Free State ) 4-9 (Fall 1:52). 1st Place Match – Ejae Jewsome (Lawrence) 21-8 won by fall over Shawn Waters (Gardner Edgerton) 6-12 (Fall 1:47).